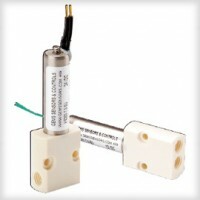 KS Series isolation solenoid valves are 2-way, normally Closed (NC) valves featuring 0.38″ (10 mm) solenoid shell diameters. The isolation valve design ensures that the only wetted parts are the valve diaphragm and the valve body. For exceptional chemical compatibility the KS Series utilizes PEEK or PPS bodies, with a choice of diaphragm materials to meet your specific needs.